In 2018, Emmanuel le Roch, skipper of the Class40 Edenred, fulfilled a boyhood dream when he participated in the Route du Rhum race alongside the very best. Strengthened by this experience and Edenred's renewed support, he sets sails for a year 2019 full of challenges, culminating with the Transat Jacques Vabre, starting on October 27, between Le Havre, France and Salvador da Bahia in Brazil. But let's take a look back on where the adventure began. "Emmanuel's personality and values perfectly embody the entrepreneurial spirit that drives the passionate teams making up our Group." "When I was a kid, I didn't want to be a superhero, I just dreamed of becoming a sailor..."
Emmanuel Le Roch grew up in Lorient, in the French department of Morbihan. Since childhood, his dreams have been dominated by the sea, adventure and the open water. His weekends growing up were peppered with outings on a small family sailboat, and he learned the ropes on an Optimist, on the estuary of the river Ter. As a teenager and member of the Carnac Yacht Club, Emmanuel sailed a racing catamaran and was crowned Champion of France in 1991 and 1993. Then he moved up to the Tornado class on the Olympic racing circuit in France and North America, but did not join the French team. “My parents were very strict: I had to finish school and find a job first,” recalls Emmanuel Le Roch. Fascinated by multihulls, the young sailor pursued his passion and befriended the Bourgnon brothers, Laurent and Yves, as well as Jean Maurel and Alain Gautier. At their sides, Emmanuel crewed on some of the greatest race boats, but above all, he shared in their preparation, participation and victories, such as the Route du Rhum 1998, won by Laurent Bourgnon. "I’ve been lucky enough to sail on some great race boats, like the Primagaz, Foncia, Bayer, Rexona, Brossard," says the Edenred skipper. “Manu is clever, kind and caring. It’s great to be able to live your dream when you’re already very busy with your job. It takes courage. He has my wholehearted support." In June 1995, Emmanuel Le Roch created Nautic Sport in Carnac (Morbihan), offering nautical activities around light sailing. In the early 2000s, the company expanded into motorboats, in Trinité-sur-Mer. Having successfully made a living out of his passion, Emmanuel now heads up a company of ten employees – which can swell to as many as 25 in the summer. 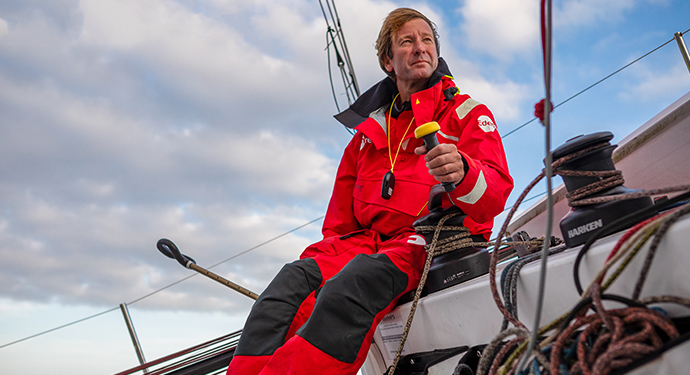 In just 20 years, Emmanuel Le Roch has established a sustainable company and formed a loyal team of employees, allowing him to take time out to fulfill his dream of participating in the Route du Rhum. The important thing is to make your dreams come true: Emmanuel Le Roch's encounter with Edenred. "I found with Edenred a partner with whom, in just a few months, we have already shared a great human adventure."